I’ll be more famous than Jonah’s whale,Yo ho ho and a bottle of rum. Captain Flint sings that ditty in my book, Tread Carefully on the Sea. And, thanks to author Robert Louis Stevenson, the fictional Captain Flint’s notoriety (rather than fame) has indeed been kept alive through the centuries. Yet the poor buccaneer gets no chance in Stevenson’s novel Treasure Island to take part in the drama. All the many references to him are retrospective as Flint is dead by the time that great adventure yarn begins. 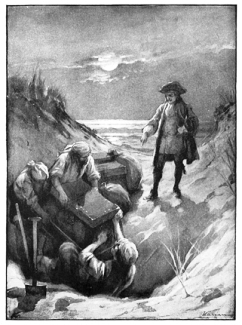 Is that fair to the man who buried the treasure on the island ? Ironically, while Stevenson gives us no description of Treasure Island’s boy narrator, Jim Hawkins (not even his age), we hear a lot about the deceased Flint. Well, let me correct you, Morgan. Those are not his last words. Captain Flint speaks loud and clear in my book, Tread Carefully on the Sea. From the time I read Treasure Island as a child, it seemed wrong that this powerful figure, Captain Flint, was only recorded posthumously. To me, Flint deserved a story of his own. 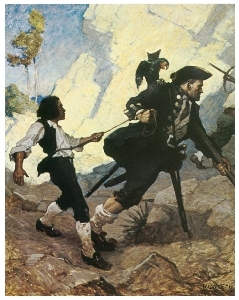 There was only one way to accomplish that – write a prequel to Treasure Island. 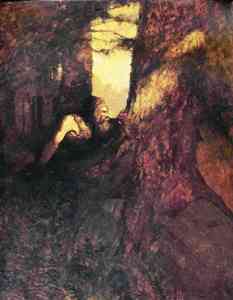 Why and how did Flint come back alone after taking six men to bury the treasure? How did Billy Bones come by Flint’s map where X marked the spot? Who were the fifteen men on a dead man’s chest (in the recurring Treasure Island song “Yo Ho Ho and a Bottle of Rum”)? Who was the “one man of her crew alive what put to sea with seventy-five” in the same song? Maddeningly, there’s a paucity of dates in Treasure Island. In the very first sentence, the first-person storyteller, Jim Hawkins, says: “I take up my pen in the year of grace 17–.” Why, oh why, esteemed Mr. Stevenson, did you not give us the full year? Flint’s treasure map is more instructive. 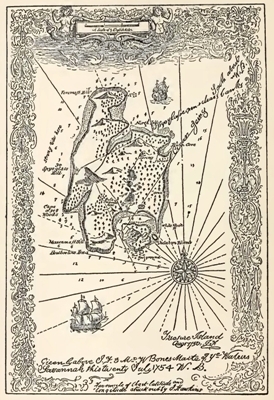 The margins contain the information that the map was drawn in August 1750, and handed to Flint’s first mate, Billy Bones, on July 20th, 1754. So, armed with Stevenson’s statements, I set about answering the questions, working around the dates and, most importantly, writing the biography for which Captain Flint had waited more than 260 years (since 1754). To be true to Stevenson’s references, Flint had to be bloodthirsty and an alcoholic, and he died from ill health in a tavern in Savannah. He also had to be cunning and resourceful. He took six men ashore with him and overcame the lot of them. What happened to the six men who helped bury Flint’s treasure? To me this added up to more than your average roughneck pirate. So I built for him the personality of an educated, witty sophisticate with intimidating black eyes and a number of complexities. 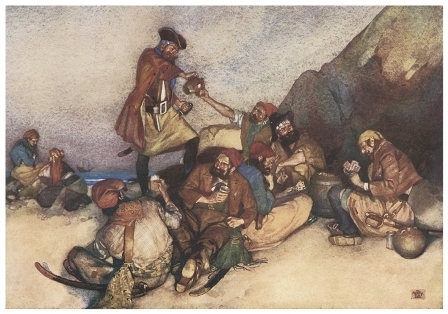 In my story he kills several men with no compunction at all, and he’s happier in the company of those he takes prisoner than that of his own crew. He trusts no one except those whose loyalty he can be totally sure of – and only Billy Bones and Israel Hands meet that criterion. So rest in peace, Captain Flint. You may not be more famous than Jonah’s whale, but history has now told your tale. 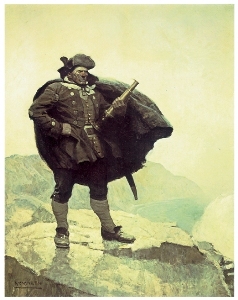 *Note: The passages from Treasure Island that are quoted here come from the edition published by Robert Frederick Ltd. of Bath, England in 1998. David started writing fiction after retiring from journalism and public relations. He supposed the books waited their turn during all the years he wrote articles, features, speeches, and promotional material for other people. His career included running a district office for a daily newspaper, helping to introduce professional PR into the British police service, and promoting a major parliamentary bill for Margaret Thatcher’s government. He lives in Somerset, one of the nicest counties in England, and is blessed with a wonderful family. He and his wife, Stephanie, have been married for forty years. They are proud of their two children Matthew and Melanie, grandsons Henry and Toby, son-in-law Jamie, and daughter-in-law Fleur. David has a big brother Dennis and cherishes the memory of his other brother Ray. He was also an author, his biggest accomplishment being a story based on the Bayeux Tapestry called Warriors of the Dragon Gold. It’s still available from Amazon and is a damn good read.